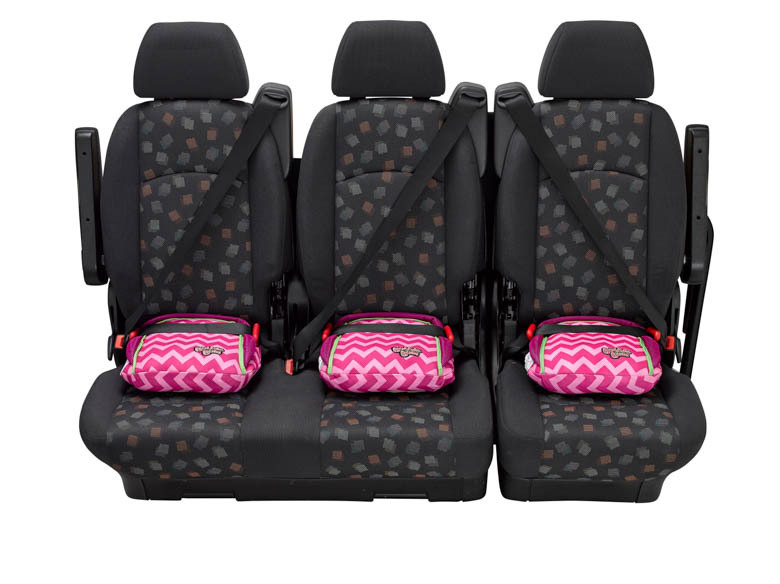 Blog Are Blow Up Car Booster Seats Safe? Are Blow Up Car Booster Seats Safe? Are blow up car booster seats safe for children? In today’s blog post we shall be discussing the safety of blow up / inflatable car booster seats. As parents and carers, it’s only natural to want the best for our loved ones, so when it comes to something as important as a car booster seat, we need to be certain that it is safe. 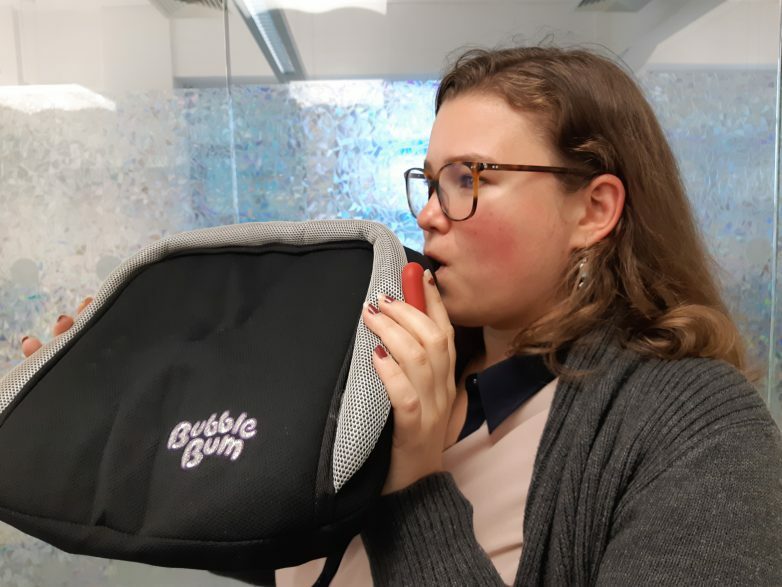 The BubbleBum booster seat is inflatable or ‘blow up’, but it’s not like those novelty inflatable hammers that you used to get at the state fair. The BubbleBum has been fully crash-tested, and meets and exceeds USA and EU booster seat safety regulations R44/04 & FMVSS 213. What is the purpose of a car booster seat? The seats, and seatbelts in a vehicle are designed to fit an adults body, and as a result, are not correctly proportioned to provide good belt fit to a child. When used correctly, the shoulder strap should ride from the shoulder and across the chest with the lap belt positioned across the bony areas of the pelvis. Without a booster seat, the shoulder strap can sit dangerously across the neck or face, with the lap belt across the soft and vulnerable abdomen, meaning that in the event of a crash, children are much more likely to be seriously injured, or worse. A booster seat works by raising the child up to a level where the seat belt can be positioned in the manner it would be on an adult… across the chest and pelvis. A booster seat is therefore, a seat belt positioning system. When they are seated on a booster seat our children are 45% less likely to sustain a crash related injury. 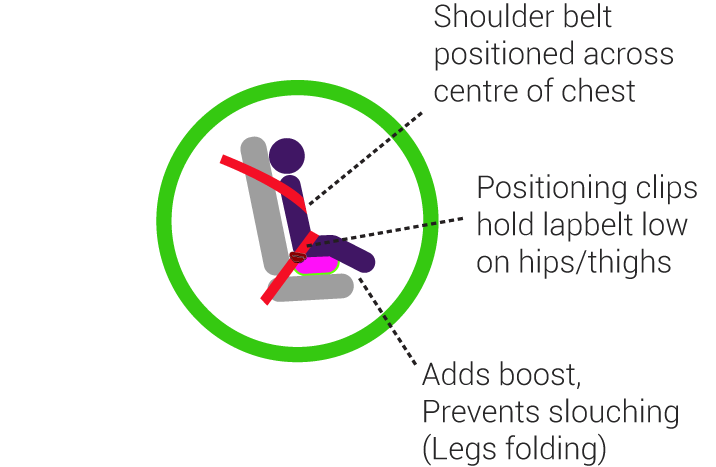 The diagram below illustrates how a booster seat ‘boost’ serves to protect your child. Does a blow up seat do that? At BubbleBum our core commitment is to make EVERY child safer on EVERY journey. Our blow up booster seat has been tested and re-tested, including extensive crash testing and found to exceed the strict USA and EU booster seat safety regulations R44/04 & FMVSS 213. In short, if it wasn’t safe, we couldn’t sell it, but we do, in 27 countries across Europe and North & South America. Each BubbleBum is made from similar components to that of airbags, life rafts and life vests. It contains memory foam technology which means it takes just a couple of puffs to fully inflate. The super tough, rigid side clips provide perfect belt fit and replace the armrests that conventional seats use to position the lap belt. This keeps the design sleek and narrow, saving space in your back seat. We believe that blow up car booster seats are the future because they fulfill the purpose of a conventional rigid booster seat, whilst being lightweight and compact enough to go anywhere with your child, including on occasions where they would otherwise be forced to go without. For this reason, we believe that blow up booster seats are not only safe, but also indispensable. As we have already discussed, the position of the shoulder belt is incredibly important in the event of a crash, but there is an additional danger, which comes about when the belt rides too high on the neck. This is uncomfortable for the child, and they will often throw their arms over the top of the shoulder belt to get more comfortable, with the belt then digging into their abdomen… severe injuries can result in the event of a crash. BubbleBum includes an extra level of insurance against this in the form of a shoulder belt positioning clip, which gives you the opportunity to position the shoulder belt more precisely than other booster seats. This clip then holds the belt snuggly in place, and prevents it from moving around.